Sometimes, especially with the shorter days and longer evenings of winter, it’s nice to cozy up on the couch and watch a show or two. I confess that my husband and I have been completely sucked into the show Suits. We saw the pilot episode on our trip back from Hawaii this December, and have been hooked ever since. In case you haven’t heard of this show, it’s about a lawyer who hires an associate who happens to be a college dropout posing as a lawyer. There’s romance, comedy, and all the elements of a show that will keep you glued to the screen well after you should have gone to bed! We’ve now watched all five seasons, and are starting in to the new season that started airing last week. Out of curiosity, what shows are you hooked on? The sweet and tangy salad described above is a great, crisp snack to crunch on when watching shows. Bell peppers are one of the best sources of vitamin C. They also provide plenty of vitamin K1, an important vitamin for healthy bones. On top of that, the cucumbers, with their 96 percent water content, will keep you hydrated. So make this salad, snuggle up with a blanket and watch your favorite show! 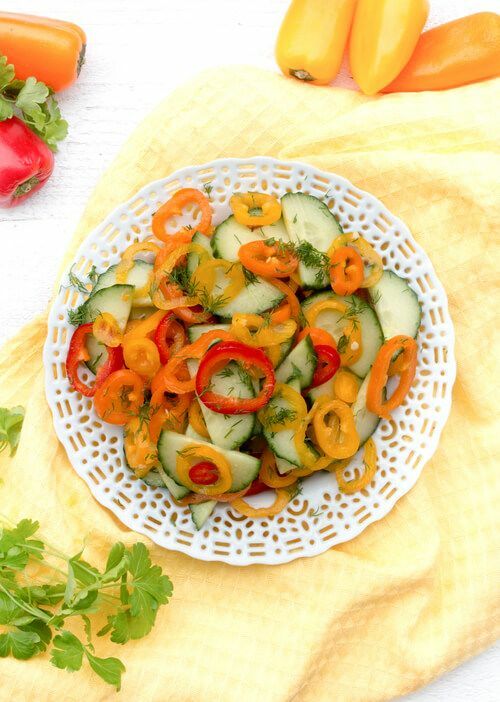 Combine peppers and cucumber with 1/2 apple cider vinegar, 1/2 Tablespoon olive oil, a pinch of salt, and fresh dill.